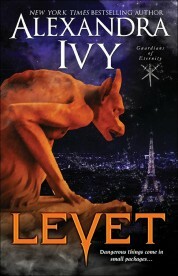 Gargoyles do not admire difference–and Levet is undeniably different. Of miniscule stature, rather beastly looks, and with fragile, delicate wings, even his family has shunned him, banished him from his beloved Paris. That he is the only gargoyle ever to help defeat the Dark Lord and his hordes of minions makes no impression. But now Levet has come home, determined to be restored to the official Gargoyle Guild. To do so, he must confront the most feared gargoyle in all of Europe. The one who tried to kill him as a child: his own mother. . .
With few allies, Levet’s survival may depend on the aid of two strangers: Valla, a beautiful but damaged nymph, and Elijah, the fiercely possessive, love-struck vampire clan chief to whom she can’t quite surrender–unless Levet has something to do with it. . . 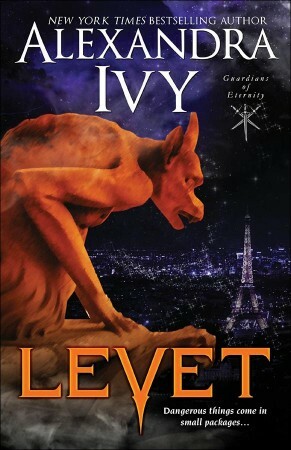 Walking through the dark shadows beneath the Eiffel Tower, Levet avoided the human tourists who strolled along the sidewalk to admire the carnival atmosphere that spilled through the streets despite the late hour. Something inside of him seemed to bloom as he savored the sights and sounds that he’d been denied for so long. It was the city of his birth. The city where he’d first spread his wings and soared toward the night sky. The city where he’d first lost his heart to a naughty imp who’d lured him beyond the few cottages that were all that made up the early town and taught him how to please a woman. And the city where his greatest enemies resided. Enemies who also happened to be his family. His sense of homecoming vanished like a bubble being popped. Being different wasn’t admired among the gargoyles. And, when it was determined he was never going to grow beyond his miniscule three foot stature and that his wings were going to remain as delicate as a dew fairy’s that shimmered in hues of blue and crimson and gold, he was tossed away like a piece of rubbish. No. He scrunched his ugly gray face into a grimace, his long tail twitching at the unwelcomed memories. He’d been more than tossed away. He’d been banished. Shunned by his own people. With an effort, he squashed the painful recollections and reminded himself he was no longer that frightened enfant. Just a few weeks ago he’d stood up to the baddest of the bad. He, Levet the Gargoyle, hero of all ages, had defeated the Dark Lord and his hordes of minions. But he’d been the one who had struck the killing blow. Right before the Dark Lord had skewered him with a lightning bolt that had burned straight through his chest and into his heart. If it hadn’t been for Yannah’s swift action he would even now be nothing more than toast. He heaved a rueful sigh, not quite as grateful as he should be. The pretty, flighty, lethally dangerous female demon was enough to make any poor man’s head spin. For weeks she’d lead him on a merry dance, appearing and then disappearing. Kissing him one minute and slugging him on the chin the next. It had been…exasperating. But also thrilling. What male did not love the danse de l’amour? But after she’d rescued him from the cellar of the warehouse where he’d halted the looming apocalypse, she’d taken him to her cozy little home. And a full-blood Jinn as a next door neighbor. Not the most comfortable place for a gargoyle who was never so happy as when he was soaring across a star-spangled sky. And then there was Yannah. The female made him natty.